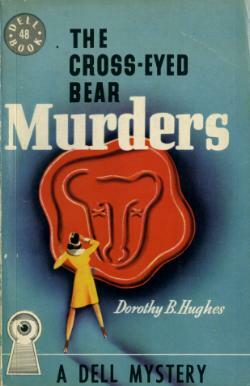 Much has been written about Dorothy B. Hughes, one time poet, mystery writer and champion book reviewer, but usually with an emphasis on the same two books over and over. Like Christianna Brand who for decades was only known for Green for Danger, you would think Hughes wrote only those two books (Ride the Pink Horse and In a Lonely Place) both of which like Green for Danger were adapted into exceptional crime movies. Is it the movies that have overshadowed her other work? 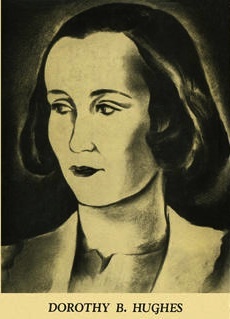 Though her overall output totals less than fifteen novels, she has a rich and varied body of work in which she played with many of the tropes of the detective novel mixing and blending them with other subgenres (the espionage tale, the woman in peril tale, the pursuit thriller) to come up with a kind of specialty tale of terror that would be her trademark. As the reviewer for the Chicago Sun once wrote: "Mrs. Hughes is...capable of making terror rise out of a sentence which, from any other writer, would seem innocuous." One of her most overlooked books is her second novel, The Cross-Eyed Bear (1940), an intriguing, exceptionally suspenseful, amalgamation of the whodunnit and the woman in peril thriller. danger's bright face. Room 1000, The Lorenzo. Fully aware that she is far from beautiful, Lizanne nonetheless dolls herself up transforming herself into a fair semblance of a glamor girl and applies for the job. To her astonishment after only a few probing questions she is almost immediately hired. And phase two of her plan can be put into operation. ...to them the father left three million dollars, unbelievably in cash. [...] The legacy was given in the form of a check, divided into three triangles, one for each son. This check could not be cashed until the twenty-first birthday of the youngest son, and only if the three sections were presented together. Each triangle contains not the son's name but Old Viljaas' seal of the cross-eyed bear. Furthermore, the check must be endorsed in triplicate with the cross-eyed bear. Shortly before his twenty-first birthday the youngest son, Dene, disappeared while on a hunting trip never to be heard from again. Murder was suspected but no body was ever found. The seal with the cross-eyed bear was thought to be in his possession also seemed to vanish. Neither could be found his triangular portion of the check. As stipulated in the will the check must be cashed by April 1. If not, the entire fortune will go to a group of "fool societies that the Old Bear favored." Lizanne is hired to help find the missing sons, Dene and Lans, recover the missing check pieces, and learn who is in possession of the all important seal with the cross-eyed bear. It is this wild "Mission: Impossible" task that takes Lizanne on a terrifying journey into a world of greed, deceit, betrayal and murder. All the while the reader is privy to all of Lizanne's secrets, cleverly and surprisingly revealed as she navigates her way through an alternative Manhattan in which no one is to be trusted. She finds herself involving innocent neighbors, implicating herself in the mysterious murder of her predecessor, and playing numerous roles with the men she meets. Though ostensibly in the employ of Folker we soon learn that she too has her own personal reasons for finding and assembling all three pieces of the highly sought after check. Revealing anything further of this densely packed story would rob any reader of the full pleasure of its unusual, truly original story. It's odd and fantastical like her first novel The So Blue Marble (1940) which had an element of the supernatural. It's suspenseful as any Hitchcock movie and deftly constructed. And above all, it's intelligently written with a cast of original characters led by the strong-willed, complicated and realistically flawed Lizanne. In only her second outing Hughes proved herself to be a contender in crime fiction with the promise of great things to come. She would more than live up to her promise in the even dozen books that followed over the next two decades. By an odd confidence I was planning on blogging one of her books too. I do agree that it's nice to read about something besides In a Lonely Place or Ride the Pink Horse. It's like with Sayers only ever talking about Gaudy Night or The Nine Tailors (perhaps we're not so far off from that, come to think of it....). I'll always choose the lesser known book by a well known writer. Every single time. I have THE DELICATE APE and THE BAMBOO BLONDE lined up for future Hughes posts. While typing out her bibliography I said to myself, "THE SCARLET IMPERIAL? I've never heard of that." Or ever seen a copy. And of course I added it to my hunt list. As for the seemingly doomed panel -- Do not despair, my friend. I have an alternate plan for getting our panel go live at Cleveland. There are always "pop-up" panels every year. And I am determined to get ours in the mix. John, that can happen when you mis-click the right word on the spell check! Of course after midnight all bets are off anyway. A terrific review John - I'm afraid I'm one of those people that only know Hughes through the those two novels (and yes, saw the movie versions first), so thanks again for the nudge. Really should try harder. You really make this one sound worthwhile even if it is not an easy one to get hold of by the looks of things - cheers. Fortunately her books usually were reprinted in paperback. Some of her first editions are very expensive. I've read three by Hughes and all were originals, for which i give high marks after reading so many books. This one sounds like it would be as good as SO BLUE MARBLE which I loved. Excellent review. Interesting choice, John. 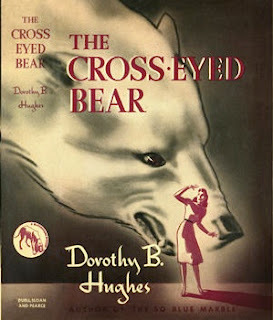 I haven't read any of Hughes novels but recently I read an autobiographical piece about her and her work at THE NEW YORKER titled "The Crime of Blackness: Dorothy B. Hughes’s Forgotten Noir" which also included a review of her last work THE EXPENDABLE MAN. I think you'll like this piece. At least she lives on in paperback form. I'll be looking for her writings in the future. I so want to read her now. I am so getting tired of saying this: Gee, John, I've never heard of this book. But hey, it's true. Never heard of the author either. Another name to add to my ever increasing Vintage TBR list. Yes, I have a separate list for Vintage. 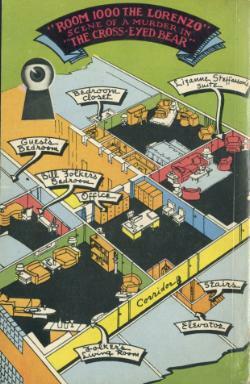 LEFT INSIDE: Greetings from Snow Hill!